It is 20 years since the discovery that the expansion of the universe is accelerating, yet physicists still know precious little about the underlying cause. In a classical universe with no quantum effects, the cosmic acceleration can be explained by a constant that appears in Einstein’s equations of general relativity, albeit one with a vanishingly small value. But clearly our universe obeys quantum mechanics, and the ability of particles to fluctuate in and out of existence at all points in space leads to a prediction for Einstein’s cosmological constant that is 120 orders of magnitude larger than observed. “It implies that at least one, and likely both, of general relativity and quantum mechanics must be fundamentally modified,” says Clare Burrage, a theorist at the University of Nottingham in the UK. With no clear alternative theory available, all attempts to explain the cosmic acceleration introduce a new entity called dark energy (DE) that makes up 70% of the total mass-energy content of the universe. It is not clear whether DE is due to a new scalar particle or a modification of gravity, or whether it is constant or dynamic. It’s not even clear whether it interacts with other fundamental particles or not, says Burrage. Since DE affects the expansion of space–time, however, its effects are imprinted on astronomical observables such as the cosmic microwave background and the growth rate of galaxies, and the main approach to detecting DE involves looking for possible deviations from general relativity on cosmological scales. 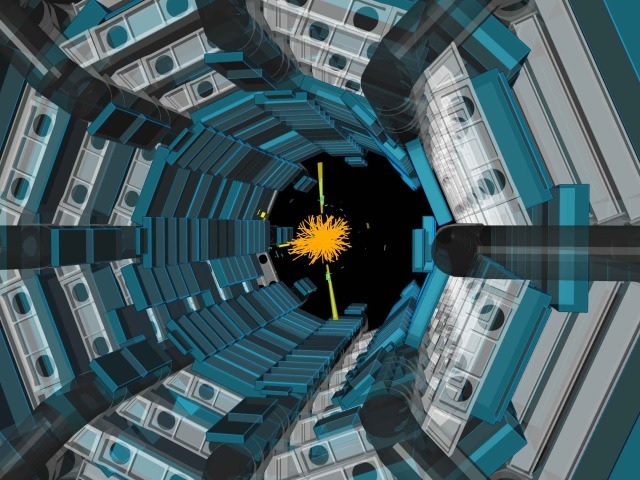 Collider experiments offer a unique environment in which to search for the direct production of DE particles, since they are sensitive to a multitude of signatures and therefore to a wider array of possible DE interactions with matter. Like other signals of new physics, DE (if accessible at small scales) could manifest itself in high-energy particle collisions either through direct production or via modifications of electroweak observables induced by virtual DE particles. Last year, the ATLAS collaboration at the LHC [below]carried out a first collider search for light scalar particles that could contribute to the accelerating expansion of the universe. The results demonstrate the ability of collider experiments to access new regions of parameter space and provide complementary information to cosmological probes. Unlike dark matter, for which there exists many new-physics models to guide searches at collider experiments, few such frameworks exist that describe the interaction between DE and Standard Model (SM) particles. However, theorists have made progress by allowing the properties of the prospective DE particle and the strength of the force that it transmits to vary with the environment. This effective-field-theory approach integrates out the unknown microscopic dynamics of the DE interactions. The new ATLAS search was motivated by a 2016 model by Philippe Brax of the Université Paris-Saclay, Burrage, Christoph Englert of the University of Glasgow, and Michael Spannowsky of Durham University. The model provides the most general framework for describing DE theories with a scalar field and contains as subsets many well-known specific DE models – such as quintessence, galileon, chameleon and symmetron. It extends the SM lagrangian with a set of higher dimensional operators encoding the different couplings between DE and SM particles. These operators are suppressed by a characteristic energy scale, and the goal of experiments is to pinpoint this energy for the different DE–SM couplings. Two representative operators predict that DE couples preferentially to either very massive particles like the top quark (“conformal” coupling) or to final states with high-momentum transfers, such as those involving high-energy jets (“disformal” coupling). The ATLAS analysis, which was based on 13 TeV LHC data corresponding to an integrated luminosity of 36.1 fb–1, re-interprets the result of recent ATLAS searches for stop quarks and dark matter produced in association with jets. No significant excess over the predicted background was observed, setting the most stringent constraints on the suppression scale of conformal and disformal couplings of DE to normal matter in the context of an effective field theory of DE. The results show that the characteristic energy scale must be higher than approximately 300 GeV for the conformal coupling and above 1.2 TeV for the disformal coupling. 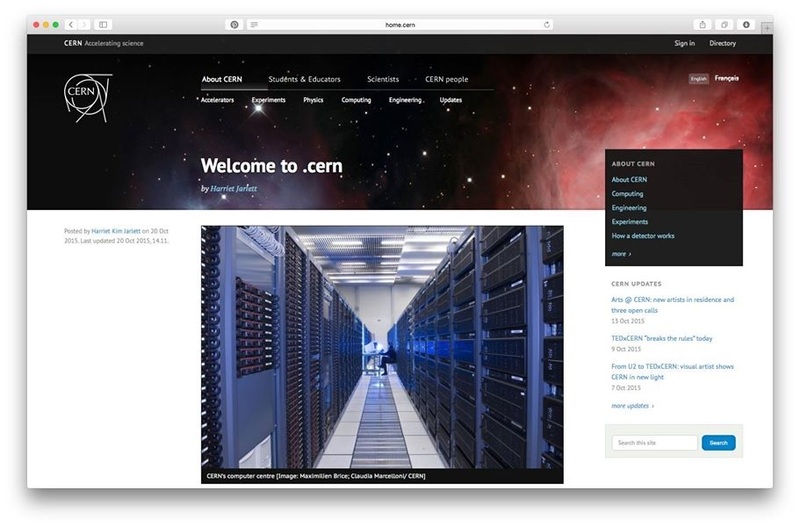 With this pioneering interpretation of a collider search in terms of dark-energy models, ATLAS has become the first experiment to probe all forms of matter in the observable universe, opening a new avenue of research at the interface of particle physics and cosmology. A complementary laboratory measurement is also being pursued by CERN’s CAST experiment [below], which studies a particular incarnation of DE (chameleon) produced via interactions of DE with photons.